Pentagon helps build Meshworm Spy drone. | The Daily Cheese. Pentagon helps build Meshworm Spy drone. Engineers have developed a new robot that has the movement of a worm it crawls along surfaces by contracting the segments along its body. The technique gives the bot the ability to squeeze through tight spaces and mould its shape to the terrain. It can also has the ability of absorbing heavy blows without sustaining damage. The Pentagon‘s Darpa research unit supported the Meshworm project, suggesting a potential military use.”[The] soft body, which is essentially compliant, exhibits large strains and enables the robot to traverse small openings and reconstitute shape, and survives from large impact force on falling,” the engineers wrote. The next generation spy drone that has echoes of the spiders from the movie Minority report will be able access buildings virtually undetected.This could be used in spying and if weaponized would make an assassins job very easy. This is the latest robot /drone that has been designed following natures pattern.Other examples include a robotic “cheetah” that can run at speeds of 18mph (29km/h), a micro-aircraft equipped with a camera that looks like a hummingbird, and AlphaDog – a four-legged robot designed to carry soldiers’ gear.We recently also saw the mosquito inspired military drone which is said to be capable of taking DNA samples or injecting a person. Developers commented that using a worm-like motion helped reduce the noise such machines produce, making them suitable “for reconnaissance purposes”.admitting the potential use in spying for this robot. When engineers attempted to create such a robot in the past they used gears and air-powered or pneumatic pumps. But these added to the bulk of the machines making them less practical for real-world uses. The Darpa-supported team instead moved their machine by using an “artificial muscle” made out of nickel and titanium wire designed to stretch and contract with heat. The team created algorithm to send a contraction wave across each of the machine’s five segments in turn, squeezing the tube and propelling it forward. This mimics the movement of its biological counterpart. Two additional “muscles” were added to the sides of the machine to pull it left and right, allowing its direction to be controlled. The engineers said that the Meshworm remained functional even after being hit with a hammer. The researchers said that the soft nature of the robot’s body allowed it to be subjected to hammer blows and be trod on without sustaining any damage because its shape changed to help absorb the blows. “You can throw it, and it won’t collapse,” said Sangbae Kim, assistant professor in mechanical engineering at MIT. A robot that can change colour to either blend in with or stand out from its surroundings has been created by scientists. The machine, designed by researchers at Harvard University, was inspired by the camouflage skills of sea creatures such as octopuses, cuttlefish and squid. 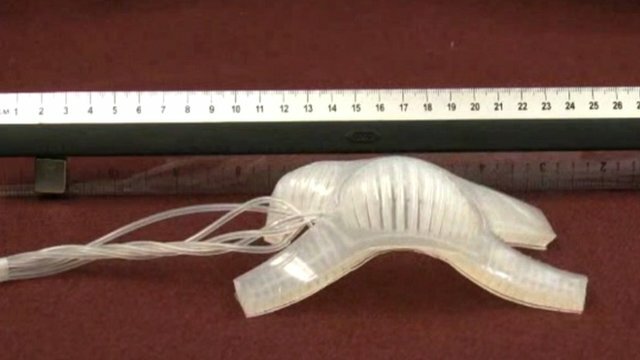 Like these cephalopods, the robot has a soft, rubbery body and can move with flexibility. Professor George Whitesides, an author of the paper, said: “Conventional robotics is a pretty highly developed area, and if you look at various robots you find that most are basically built on the body plan of a mammal. 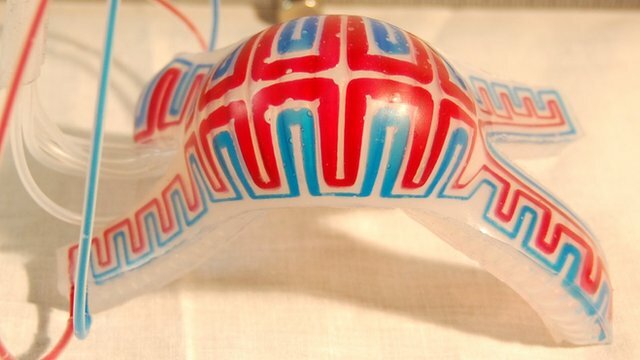 In 2011, the research team published a paper in the Proceedings of the National Academy of Sciences (PNAS) that outlined details of a “soft robot” that could crawl and bend under obstacles. The machine was made from silicon-based polymers, and its movement was driven by air pumping through tiny cylinders in its four “legs”. Now the scientists have added another layer of complexity to these robots by giving them the ability to disguise themselves. The camouflage-bots are covered in a network of tiny channels. As different dyes are pumped in, the robots can quickly change their appearance. As well as changing colour, hot or cold fluids can be pumped into robots, enabling them to be thermally camouflaged, and fluorescent liquids allow them to glow in the dark. Currently, the fluid is pulled in from a reservoir, but in the future it could be incorporated into the robot’s body.